Analog Devices, Inc. has announced four fixed point digital signal processors (DSPs) qualified for automotive applications. 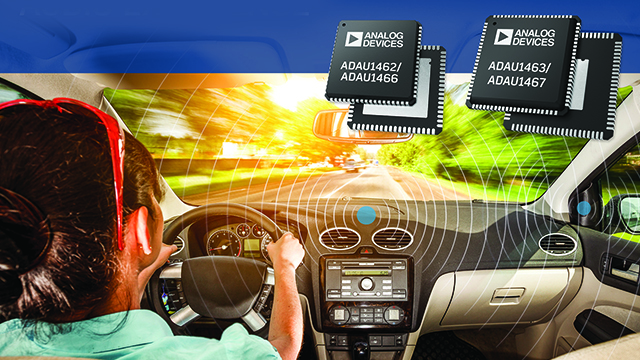 Designed to fit the emerging demands of new and improved audio algorithms,the ADAU1466 and ADAU1467 SigmaDSP processors offer market-leading performance in fixed point DSP processors with three times the internal program memory and two times the internal data memory of the previous generation. The ADAU1463 and ADAU1467 utilize an 88-pin LFCSP package and feature eight pins that can be configured as serial data inputs or outputs. 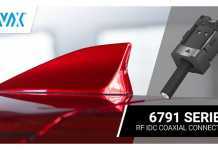 These additional pins provide greater flexibility in amplifier or head unit designs to support applications such as hands free, active noise cancellation, and acoustic noise reduction algorithms among others. Like all SigmaDSP processors, the ADAU1463 andADAU1467 feature a unique hardware architecture optimized for efficient audio processing. Their quad Multiply-Accumulate (MAC) architecture includes audio specific hardware accelerators that optimize MIPS performance for latency sensitive applications. The ADAU146x series uses ADI’s award-winning SigmaStudio graphical programming tool that allows signal flows and applications to be developed and tuned quickly and with a minimum learning curve. When compared to alternative DSP devices, the ADAU146x series provides unmatched parallel processing performance, flexibility and system scalability. 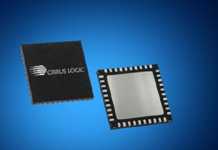 The availability of both a cost effective 150 MHz and a 300 MHz DSP core gives alternatives to system designers for traditional and more demanding applications. The 300 MHz DSP core provides up to 1.2 GMACs, executing 6,144 instructions while running at 48 KHz audio sample. 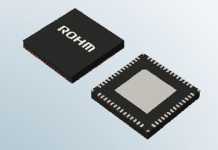 The built-in stereo asynchronous sample rate converters (ASRCs), audio signal router matrix and an on-chip RAM that is two times larger than previous generation DSPs allow for the versatile and simplified execution of very demanding algorithms. The integrated PLL and flexible clock generator hardware can generate up to 15 audio sample rates simultaneously.